A zythophile . . .? What’s a Zythophile? The English language evolves at an incredible rate, gobbling up words from other languages, and inventing new ones. Well here is one I hadn’t heard of before until yesterday – Zythophile. It’s pronounced zee-tho-fyle. What does it mean? It means ‘a lover of beer’. It’s a word that is derived from the greek and thus its etymology should be perfectly acceptable to philologists. So what is this to do with our hero Thomas Fowell Buxton? Well TFB was a zythophile, at least he made his living out of beer. In 1808 he joined the brewing firm of Truman and Hanbury in Brick Lane, Spitalfields and later became a partner. 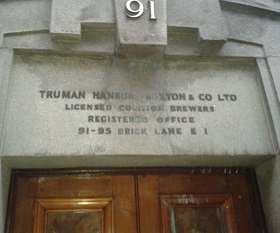 The brewery closed in the late 1980’s but the buildings still remain and the the lintel over the old brewery offices at 91 Brick Lane, still carries the names of the partners ‘Truman, Hanbury and Buxton’. The brewery itself has long been sold and redeveloped into a home to bars, cafes, clothes shops, art galleries. A weekend food hall in the old boiler house has take-away food from an amazing spread of countries, There are markets on Saturdays and Sundays and exhibition halls, shows and festivals.. Recently, enthusiasts have worked to take up brewing again in the tradition of Truman, Hanbury and Buxton. The new brewery is being set up in Spring 2013 at Stour Road, Hackney Wick. The Black Eagle flies again! This entry was posted in Fun on April 29, 2013 by tfb_admin. 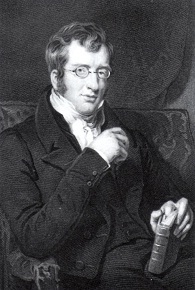 Who was Sir Thomas Fowell Buxton and why are we so interested in him? Buxton was a philanthropist and Parliamentarian and was MP for Weymouth, Dorset between 1818 a nd 1837. During his time in Parliament he achieved many changes for the common good. but his most memorable achievement was the Act of Parliament of 1833 to abolish slavery in the British Empire. William Wilberforce’s Act of 1807, abolished the Slave Trade, but people were still enslaved on the plantations. Their children were not their own, and they or their children could be sold on. It was necessary to finish the task. .In 1833 after a long campaign in which he was subjected to virulence, lampooning and attempts at character assassination, he succeeded in having Parliament pass an Act for the liberation of slaves. All slaves became free from midnight on 1st August 1834. On that day, 800,000 slaves ceased to be property, bought and sold at market like cattle, subject to arbitrary and often very cruel punishments, and with no standing in law. They became citizens, able to own property, maintain their marriages and families and their children became their own. In spite of many people’s fears, the liberation passed off peacefully. There was no revenge, and neither did the erstwhile owners misbehave. Buxton and his colleagues had achieved the liberation by parliamentary process – something that could only be achieved in the USA by a great civil war. Buxton inherited Belfield House, Wyke Regis, Weymouth from his grandmother in 1814. Belfield House, fully completed in 1786 is in the palladian style, and is in private hands today. Buxton lost his Parliamentary seat in the 1837 election and retired from politics. In 1840 he was made “Baronet Buxton of Belfield in the County of Dorset and of Runton in the County of Norfolk“. However, the years of hard work had taken its toll. He died at Norfolk in 1845 at the comparatively early age of 59. This entry was posted in Life and works on April 26, 2013 by tfb_admin.